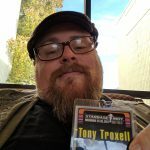 Over the last few weeks, I’ve been talking about the local Star Trek/Science Fiction/Science convention that was coming up here in Indy, Starbase Indy. I had a podcast episode, I had a Things to Do post, and I was pretty much name dropping it for the last few months in a couple dozen other posts. I’ve been talking for the past few years about attending SBI again, for the first time since the 90’s, but every year has ended with “maybe next year…” Well, this year, I had my mind set. I would be returning to the con! Lizz and I were psyched, especially with the changes they had made, going from a standard fan-run science fiction convention to a full-on, registered not-for-profit convention that covers not only sci-fi, but also STEM! So, we dropped by on Friday, picked up our badges (purchased, not Press, in case you were curious), and had a pretty great time until everything closed down on Sunday. First off, I want to talk about the general feel of the con. The convention was held at the Wyndham West down by the old airport in Indianapolis, which has been the home of many different Geeky cons since I started the blog, so I am fairly familiar with it. It had most of your normal convention trappings, with a main stage, panel rooms, a dealer’s room (which was NOT full of Funko! Pops!, a con suite, and Gaming With Scott camped out in a corner, recording podcast episodes. The crowd seemed to be having a pretty good time, and there was a fun, positive atmosphere over most of the show. Now, I’m not going to be able to talk much about the celebrity guests. As most of you know, I don’t do cons for the celebrities, no matter how cool and engaging they are with the fans. I do them to see cool costumes, neat things in the dealer’s room, and to see friends. This time around, though, I had the opportunity to sit in on many of the panels offered, like the Getting Started in Cosplay panel for Lizz, and the “Evolution in Star Trek: Why are There So Many Humanoid Species?” panel by Dr. Mohamed Noor, which took a look at reasons for this beyond the fact that it’s the most cost-effective way to portray aliens. I had the opportunity to learn about the evolution of VR technology, and then get the opportunity to try out VR with environmental effects, thanks to Chauncy Frend of IU. Heck, the Star Trek Discourse group had the opportunity to hold a discussion about Star Trek Discovery with a full room of Trekkies, which was followed up by Carl and I holding a standing-room only discussion about The Orville, which were both a lot of fun, and very positive! In addition, they had a concert by the local band Five Year Mission, who didn’t fail to mention their Kickstarter many times over the course of the evening (have you supported it yet? GO DO IT!). While I’ve had the pleasure to talk with many of the members at events, and they have been gracious enough to allow me to use their music on the podcast, this is the first time I’ve had the opportunity to really watch one of their shows, as I don’t count the times they’ve been playing in the background at Scotty’s downtown. They have a great energy, they rotate around the stage, playing different instruments, and they are great performers. Plus, having them play on a stage that’s set up like the bridge from Star Trek: The Next Generation is just pretty cool, as well (yes, I know, they’re a TOS band. Still.). Starbase Indy was a great time, with a lot of people having fun. Heck, my buddy Gregg (remember this podcast episode?) was able to raise almost $1,000 for Signing Away Hunger, which blew away his expectations. I know the staff of volunteers worked their collective arses off to put on a show that was both fun, and education, for everybody. Lizz is already looking into how to help out with next year’s event, and we’ve already discussed our plans for next year, such as getting a hotel room, and putting together Star Trek costumes. As far as Geeking in Indiana is concerned? Of course, I’ll be promoting the heck out of the show, and I know we wouldn’t mind a larger room for the DISCO and Orville panels next year! Thanks to everyone who worked hard to put on the show!